Cinematic Paradox: Could You Kill Your Best Friend? Could You Kill Your Best Friend? Written by: Kenta Fukasaku, based on the novel 'Battle Royale' by Koushun Takami. Starring: Tatsuya Fujiwara, Aki Maeda, Tarô Yamamoto, Takeshi Kitano, Chiaki Kuriyama, Sôsuke Takaoka, Takashi Tsukamoto, Yukihiro Kotani. Two or so weeks ago, The Hunger Games came out. It seems like everyone saw it. And then everyone reviewed it. There were two words that appeared in every single review I read: Battle Royale. Every time I clicked on a review, I felt compelled to find those words and to see what kind of slam they had against The Hunger Games for 'ripping off' Battle Royale's premise. Unless, of course, I was reading a 'review' from someone in the target audience who had no idea that Battle Royale existed, or that Japan made movies, for that matter. Basically, here's the main crux of this The Hunger Games/Battle Royale situation: people who care about The Hunger Games probably haven't heard of Battle Royale; movie bloggers will always point out how similar The Hunger Games is to Battle Royale; and people who love Battle Royale are most likely to hate The Hunger Games, even without seeing it. I am a person who cared about The Hunger Games and was aware of Battle Royale, but I only just saw the latter last night. In all honesty, I really liked The Hunger Games, but Battle Royale was a far better movie. And that is where the comparisons shall end. The film is set in the future, where Japan has basically gone to ruins and the youth are taking over the world with their recklessness. 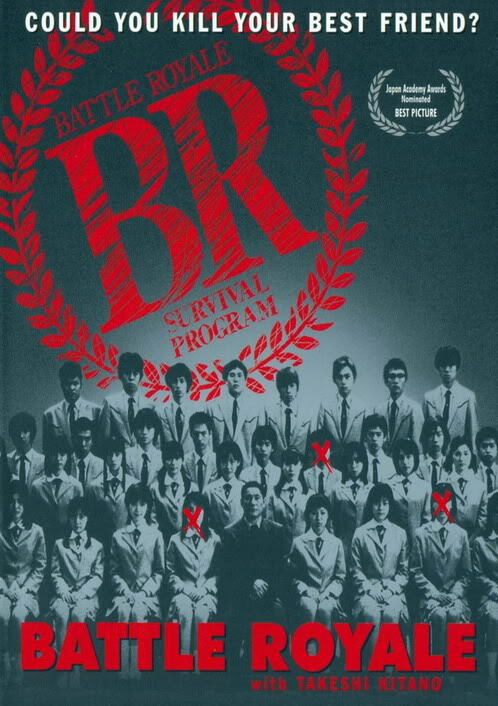 A group of forty-two students are chosen to compete in the 'Battle Royale', where they are left on a deserted island with a few food rations and a bag with a random weapon in it, and they have to kill everyone else in the battle in order to go home. It is a fairly simple premise, with more weight added to it because of the strange moral dilemma the group of students find themselves in. Sure, it is wrong to kill anyone, no matter if you know them or not. However, these students all know each other. Some of them are best friends with each other. Some of them are bred out of different cliques. Some of them have been secretly in love with one another. Some of them hate each other. 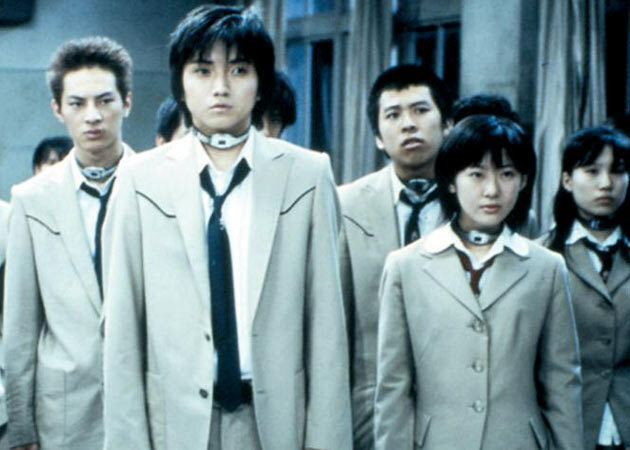 The scariest thing about Battle Royale is that it is the perfect allegory for being a teenager: the Battle Royale is the perfect chance to kill someone you've always hated but never let on about your feelings in the real world. Battle Royale gets everything right when it comes to the depiction of the teenagers. There are so many characters who have different roles to play when it comes to the game, and each actor that plays them gives them an extra intensity which is, quite frankly, extremely unsettling. In some cases, the faces that were the most scared when they were first thrown into a room and told about what they were about to do completely changed once they set foot on the battleground. They became maniacal, intent on survival, but also intent on revenge. Then there were the ones who trusted their friends to keep them safe, but then had the tables turned when their friends turned into enemies. 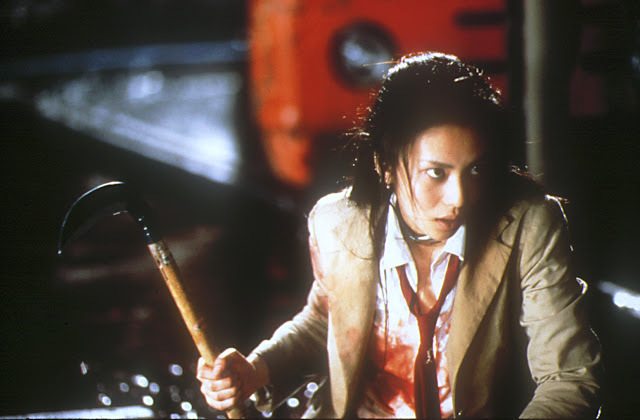 To add to that, there are two exchange students, Kiriyama and Mitsuko who run rampant with their heartless, psychopathic murderous demeanour. The amount of different, vivid personalities that were torn apart by this vicious system is the kind of stuff that makes me look at the classes that I'm in and fear for the future. Thank goodness it is the holidays, so at least the scars will have healed a little bit and I won't be looking at my peers so strangely. There's no denying that the film is sick in every way. The violence is abundant - perhaps more so than any other film I have seen. The way that the Battle Royale is presented - in a little 'how to' video with an over-happy girl instructing the students - is sick. Sometimes, it is a little too sick for my likings. It goes over-the-top frequently with the violence, which sort of detracted from the true immorality of the film. I never really knew how seriously it wanted to be taken: whether it wanted to be the kind of movie that was called 'cool' despite all the killing or the kind of movie that realised all of the violence that was going on in it. I would have gone for a little more realism, but I thank my lucky stars that this was not a case of realism = shaky cam. However, this film was quite the experience. An experience which I don't wish to revisit in the near future, but will have etched in my memory for a very long time. Which will be helpful because I'm definitely not showing this to my kids. I think they'll be better off with The Hunger Games if they ever develop the desire to see young people killing each other. I'm so glad I am watching these films after my school is over. First because it makes me feel safe, and second because I can now look at it more objectively and with some sort of experience. I found parts of it funny but in a QT sense. Like that video was insane, and so were the cheerleaders killing each other. It is a very bloody satire, so I could take it seriously and laugh about it too. Sort of like Dr. Strangelove. I wonder what this film would be like to watch after I've finished work. I should test that out. It's been about 8 or 9 years since I saw Battle Royale, and our relationship is still going strong! Something that you might not have gotten from it is the kind of Japanese-ridiculous humour than can often be found in their films, similar in a way to another favourite of mine Confessions - the kind of ridiculousness that never steps too far because it works for the film! Incidentally, I was going to pick up Battle Royale a couple of weeks ago as it has been a while since I've seen it, and you've definitely urged me to watch it for the 686868th time! 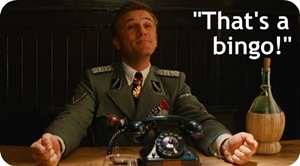 I didn't mean to come across as a Hunger Games hater, either, in something I said about it a couple of weeks ago to you! While I didn't like the book and the writing style, I can say that it is a lot better than terrible, terrible books I've read marketed at a young adult audience over the years. Just found Katniss incredibly irritating for my liking...however, it hasn't sort of put me off watching the film, this is just my reaction to having read the book a couple of years ago! 686868 times?! I couldn't imagine that! The Hunger Games isn't all that great - I'm very neutral about it. I mean, I like the book, I saw the movie, but unlike most teens, I've already moved on from it! And I won't watch the sequel, but I'll try and find the comic. The sequel is just, so, I don't know, out of place. Think that is the reason why it doesn't work. Shame really, because the first film - as you have seen - is SO good. But do source at the comic or the book! Would be interested to know your thoughts on it! Great flick indeed and a cult classic for a reason. Even to this day, it's still a pretty shocking thing to see kids in a gladiatorial game to the death but it's done in such a way that it's more entertaining and hilarious than unsettling. It is quite entertaining, but I found it quite unsettling! Nice review. I'm glad more and more people are checking this one out. I find it funny that you would show your kids "The Hunger Ganmes" instead of "Battle Royale" when you yourself said that BR was a better movie. I don't belive showing toned down violence is morally right becuase than most people will start to belive that guns don't actually hurt you they just make you fall down. I do plan on reading "The Hunger Games" very soon once the hype dies down a bit because I belive both stories share simmilar premises but are very different from eachother. Good point there, but I'd probably show them The Hunger Games because it is a little less disturbing. 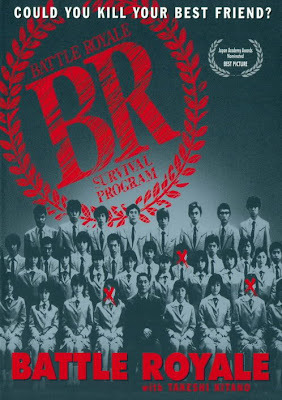 As soon as they hit the right maturity level, I'll be bringing out Battle Royale as the movie of choice before bed time. What a good parent I'll be! Yeah, this one is fantastic. And i agree with Cherokee on Battle Royale 2 being disappointing. I'll take both of your words for it! I haven't seen Batte Royale, and I probably won't, anytime soon, either- your review didn't help:) Don't get me wrong, it was great, but it's not my type of movie....although maybe I should see it- my japanese film knowledge is not strong! My Japanese film knowledge isn't strong either. I am going to start changing that, though! Great review Stevee! I probably won't be watching this one, but it sounds pretty interesting. The last picture is very creepy! Haha, that is a very scary picture indeed! This is one of my favorite films from the last decade. I'm glad the recent comparison to Hunger Games is getting it some greater attention. So am I. It definitely deserves it. I absolutely love this movie. Haven't really got involved in The Hunger Games debate, haven't seen it ever. But I love Battle Royale. Don't get involved in The Hunger Games debate, it isn't worth it! Where did you find this movie? I'm actually kind of keen for a watch just so that I can compare the two myself. Though in saying that, this was a really interesting read, and I love how you didn't spend the whole post trying to compare the two (even though they sound quite similar). I got it off Fatso (our online rental service), but I'm fairly sure it is impossible to find. Mind you, it just came out on DVD (I think) after being banned for so long. Good luck finding it!